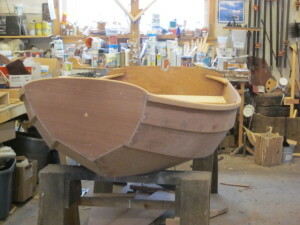 Currently being completed at Whetstone Boats is this 7’7″ Nutshell Pram designed by Joel White. The Nutshell is built using the glued plywood lapstrake method with the finest marine grade mahogany plywood. Her rails and knees are solid mahogany and her frame and stem are of laminated teak. All fastenings and hardware are of bronze. This boat is intended to be a rowing version, though the Nutshell is also available as a sailing dinghy. 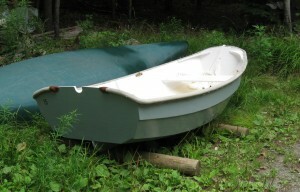 In the sailing version, the rudder and dagger board stow neatly behind the aft seat. A lug rig of varnished spruce spars supports the sail. Other options and delivery are available. The current project ready for your choice of colors.